On arrival, transfer from Vancouver International Airport/Cruise Terminal/Pacific Central Station to hotel. 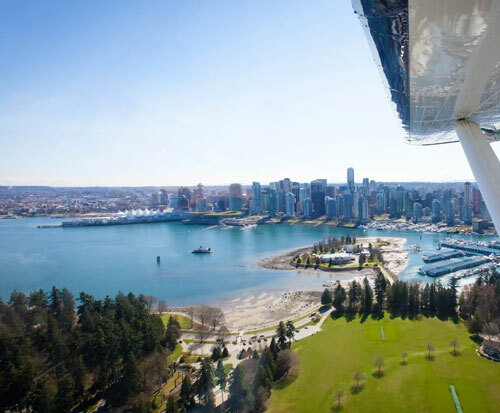 In evening visit “FlyOver Canada”, best of Vancouver’s attraction which offers a spectacular virtual Flight over Canada. Overnight in Vancouver. After breakfast, proceed on Grouse Mountain and Capilano Suspension Bridge Tour. Crossing Lions Gate Bridge, look-out for British Property's exclusive homes, visit Capilano Salmon Hatchery and continue to the 230 feet Capilano Suspension bridge. At Grouse Mountain - ride the famous Skyride to 3700 ft. high mountaintop playground. Ample time to visit Theatre in the Sky’s "Born to Fly", seasonal logging shows, Peak Chairlift and other activities. Overnight in Vancouver. After breakfast, proceed on a full day tour to Victoria. After a 90 minute ferry ride, visit Butchart Gardens where over 50 acres of magnificent gardens await you. Next enjoy a scenic ocean drive with vistas of Juan de Fuca Strait and the Olympic Mountains to Victoria. On arrival, you will have ample time to explore the world famous Fairmont Empress Hotel, British Import Ships, Parliament Buildings and other attractions around Inner Harbor. Late evening return back to Vancouver. Overnight in Vancouver. After breakfast, proceed to Whistler. Long regarded as one of the top resorts in North America. The Sea-to- Sky highway boasts of breathtaking views and scenic stops that include the wonderful 335-meter Shannon Falls. Afternoon take the exciting Peak-2- Peak Gondola, spanning the distance between Whistler and Blackcomb’s peaks, wait for the silver gondolas as they offer glass bottoms for a 360˚ experience. In the evening return back to Vancouver. Overnight in Vancouver. After breakfast, proceed on Vancouver City Tour. See Canada Place, Robson Street, the Public Library, Sports Venues, Theatres, Chinatown and Gastown. Soak in the natural splendor of Stanley Park’s Totem Poles and sightsee from Prospect Point. Afternoon checkout and transfer to Cruise Terminal/Pacific Central Station/Vancouver Airport.